Encourages lowest-common-denominator solutions which offend no one. Encourages the free exchange of conflicting views, which excites everyone. Tends to stick with the familiar and squelch provocative debate. Explores the unfamiliar and stimulates provocative debate. “Can’t we all get along” approach. “Promote diversity” approach. In the book Economics in One Lesson Henry Hazlitt shows how this cognitive error crops up in economic decision making. People make economic decisions based on what they immediately see (e.g. “adding a tariff will result in these — visible — people keeping their jobs, so let’s add a tariff”), and they fail to consider the unseen possibilities and things that could be (e.g. by adding a tariff some people keep their job, but the rest of the population — the unseen individuals — subsidizes them by paying higher prices at the market). This cognitive error — focusing only on what is visible and seen — rears its head in many ways, resulting in many missteps. People’s performance (in an organization) depends on the resources they have to work with, including help they get from colleagues, and the infrastructure that supports their work. It is impossible for even the most talented people to do competent, let alone brilliant, work in a flawed system. A well-designed system filled with ordinary — but well-trained — people can consistently achieve stunning performance levels. Why do so many companies still place so much emphasis on getting and keeping great people and so little on building and sustaining great systems? A big part of the answer is that Western countries glorify rugged individualism so much that we make cognitive errors. We give too much credit to individual heroes when organizations do things right and place too much blame on individual scapegoats when things do wrong. Mathematician studied for centuries the abstract problem of drawing tangents to curves before Newton finally discovered what the subject really is about — rate of change. It is a well-founded historical generalization that the last thing to be discovered in any science is what the science is really about. Men go on groping for centuries, guided merely by a dim instinct and a puzzled curiosity, till at last some great truth is loosened. If you stare (below) at any one of the white circles you will notice black dots appearing and disappearing in some of the surrounding circles. 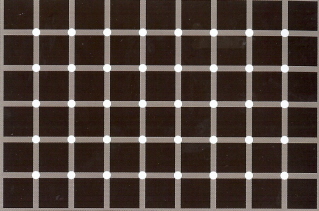 But if you switch your gaze to one of these black dots it immediately turns white again and stays white. You can never catch a black dot in the act. This simple optical illusion shows in a rough way a quantum physics idea: the act of measurement affects a quantum system. Is the mind a singularly frozen form? The art of a great painting is not in any one idea, nor in a multitude of separate tricks for placing all those pigment spots, but in the great network of relationships among its parts. Similarly, the agents, raw, that make our minds are by themselves as valueless as aimless, scattered daubs of paint. The value of the human mind lies in its vast, connected network of agents. A good book deserves an active reading. The activity of reading does not stop with the work of understanding what a book says. It must be completed by the work of criticism, the work of judging. There is a tendency to think that a good book is above the criticism of the average reader. The reader and the author are not peers. The author, according to this view, should be subjected to a trial only by a jury of his peers. There is a certain truth here, of course, but there is also a good deal of nonsense about the impeccability with which books are thus surrounded, and the false piety it produces. Readers may be like children, in the sense that great authors can teach them, but that does not mean they must not be heard from. It is true that a book can enlighten its readers, and is in this sense superior to them, should not be criticized by them until they understand it. When they do, they have elevated themselves almost to equality with the author. Now they are fit to exercise the rights and privileges of their new position. Unless they exercise their critical facilities now, they are doing the author an injustice. He has done what he could to make them his equal. He deserves that they act like his peers, that they engage in conversation with him, that they talk back. Amid all the deception and misinformation on the Internet, some sites stand out as mostly reliable and unbiased. Here are a few of them. All are free, unless otherwise noted. http://www.cdc.gov/ The National Center for Health Statistics, of the Centers for Disease Control, has official data on births, deaths, accidental injuries, marriages, and divorces. The “FastStats” feature allows easy location by topic. http://www.consumerreports.org/cro/index.htm The online version of Consumer Reports magazine, publishing unbiased test reports since 1936 on products of all sorts, from autos to kitchen appliances. Published by the nonprofit Consumers Union, which accepts no advertising or even free test samples. A $26 annual subscription can prevent mistakes costing much more. http://www.opensecrets.org/ The Center for Responsible Politics is a private, nonprofit group that collects official data on political donations and lobbying and provides useful analysis of which interest groups gave most. http://www.cbo.gov/ Lawmakers of both parties rely on the Congressional Budget Office for analysis of economic trends, federal spending, and the deficit, and of the likely impact of any new legislation. http://www.kff.org/ The Kaiser Family Foundation, whose stated mission is to “help improve health policies and programs for people in greatest need,” provides a wealth of nonpartisan information about Medicare, Medicaid, private health insurance, AIDS, and women’s health. http://www.bls.gov/ The Bureau of Labor Statistics collects official statistics on unemployment, jobs, inflation, and wages. http://www.census.gov/ The U.S. Census Bureau site supplies official statistics on population counts, poverty, household income, health insurance coverage, and home ownership. http://www.eia.doe.gov/ The Energy Information Administration has official statistics on all sources of energy, including gasoline prices, sources of crude oil, nuclear power, and solar power. The “Kids Page,” more sophisticated than it sounds, provides basic summaries. http://www.quackwatch.org/ Dr.Stephen Barrett’s respected and thoroughly documented “guide to Quackery, Health Fraud, and Intelligent Decisions” about medicine. http://www.gao.gov/ The U.S. Government Accountability Office is a hard-nose, non-partisan watchdog agency set up by Congress. The site contains reports on “high risk” programs vulnerable to fraud, waste, and mismanagement. http://www.factcheck.org/ FactCheck.org is a nonpartisan, nonprofit, “consumer advocate” for voters that aims to reduce the level of deception and confusion in U.S. politics. This site monitors the factual accuracy of what is said by major U.S. political players in the form of TV ads, debates, speeches, interviews, and news releases. http://www.lii.org/ The Librarian’s Internet Index has links to thousands of websites that have been screened by professional librarians — people who look things up for a living. It’s more than 20,000 entries are organized under 14 main topics and nearly 300 related topics. Raw cognitive ability — at least performance on tests that measure it — isn’t nearly as difficult to enhance as many people think. When people believe they can get smarter, they do. But — and this is very important — when people believe that cognitive ability is difficult or impossible to change, they don’t get smarter. A series of studies by Columbia University’s Carol Dweck shows that when people believe their IQ level is unchangeable, “they become too focused on being smart and looking smart rather than on challenging themselves, stretching and expanding their skills, becoming smarter. Dweck finds that most people believe either that intelligence is fixed or that it can be improved through effort and practice. People who see intelligence as fixed believe statements like “if you are really smart at something, you shouldn’t have to work hard at it,” don’t take remedial classes to repair glaring deficiencies, avoid doing things they are not already skilled at because it makes them look dumb, and derive less pleasure from sustained effort and commitment. After all, they believe, if you have to work hard at things, it means you aren’t that smart. Exceptional performance doesn’t happen without exceptional effort, and even allegedly inherited abilities — like IQ and other “smartness” measures — improve markedly and continuously when people work hard, have good coaching, and believe they will keep getting better. The nature versus nurture debate persists in academia and society. But natural gifts are useless without lots of practice. People, teams, and organizations that are novices at something almost always do it badly at first; brilliant or at least competent performance is achieved through raw persistence, coupled with the belief that improvement will happen. What people are able to do as beginners is far less important than whether they try hard and keep learning every day. Research in dozens of domains reveals a similar story — exceptional performance doesn’t happen without approximately 10 years of nearly daily, deliberate practice, for about four hours a day, by people who somehow (e.g. coaching, skilled peers or competitors, or books) have access to the best techniques. This 10-year rule holds in every domain — chess, medicine, auditing, programming, bridge, physics, juggling, dance, and music. And once achieved, exceptional performance can’t be maintained without relentless effort. You are currently browsing the Diverse Thoughts blog archives for November, 2007.